Situated in this HIGHLY SOUGHT AFTER LEVERSTOCK GREEN location this extended FOUR BED semi detached home offers superb living accommodation. Including a downstairs cloakroom, lounge with separate dining room, conservatory, refitted kitchen, MASTER BEDROOM WITH ENSUITE, luxury bathroom, GARAGE with extensive parking, and enclosed gardens. All positioned in a quiet CUL DE SAC. Double glazed window to the side, door to cloakroom and door to entrance hall. Comprising low level WC, wash hand basin, tiled splash backs and flooring, radiator, porthole window to the front, coving to the ceiling. Stairs to the first floor with under stairs storage cupboard, radiator, wood effect flooring, coving to the ceiling. double glazed aspect to the front, feature fireplace and surround with inset gas fire, radiator, wood effect flooring. Double glazed doors leading to the conservatory, two double glazed windows to the rear, feature fireplace and surround with fitted gas fire, wood effect flooring, coving to the ceiling. A UPVC double glazed conservatory with double doors leading to the rear garden, tiled flooring. Fitted with a range of high gloss base and eye level storage units with work surface areas, inset single drainer sink unit with mixer tap set below double glazed window to the rear garden, four ring gas hob with canopy extractor over and electric oven below, integrated dishwasher and washing machine, space for fridge freezer, tiled surrounds, recessed spot lighting, double glazed door to the side. Stairs to the first floor with double glazed window to the side, radiator, coving to the ceiling, stairs to the second floor. With walk in double glazed bay window to the front, built in wardrobes, radiator, coving to the ceiling. Double glazed window to the rear, built in wardrobe, coving to the ceiling, radiator. 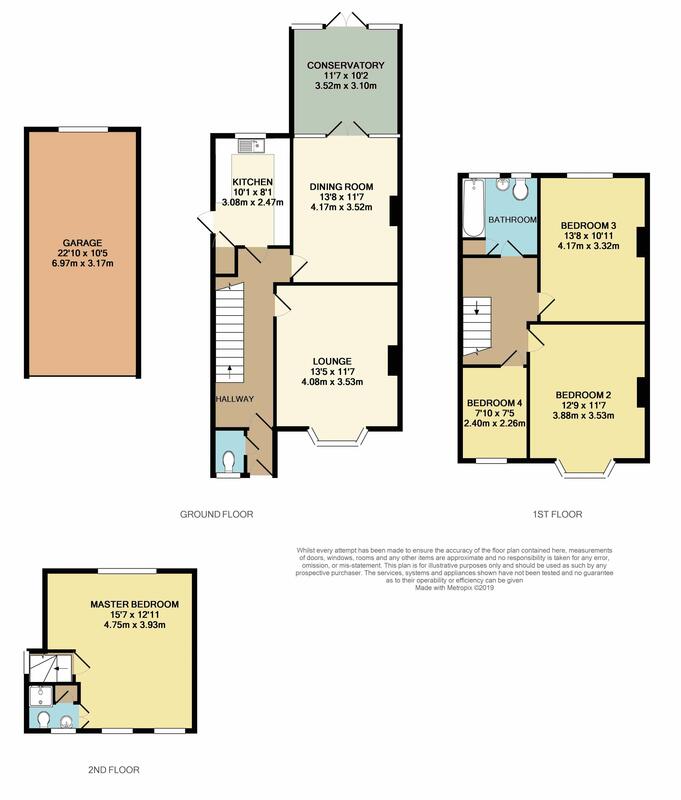 A four piece white suite comprising low level WC, pedestal wash hand basin, panel bath with mixer tap and hand held shower attachment, enclosed shower cubicle, two double glazed windows to the rear, radiator, tiled surrounds, recessed spot lighting. Stair to the second floor and master bedroom, double glazed window. With a double glazed window to the rear and two Velux windows to the front, two radiators, recessed spot lighting, wood effect flooring. A larger than average garage with up and over door, power and lighting, double glazed window to the rear, courtesy door to the rear garden. Ample off road parking with covered side paring area leading to the garage. Laid mainly to lawn with surrounding borders. A fully enclosed rear garden with paved area to the immediate rear, laid to lawn with surrounding borders and screened by pane fencing and mature trees an shrubs, gated side access.